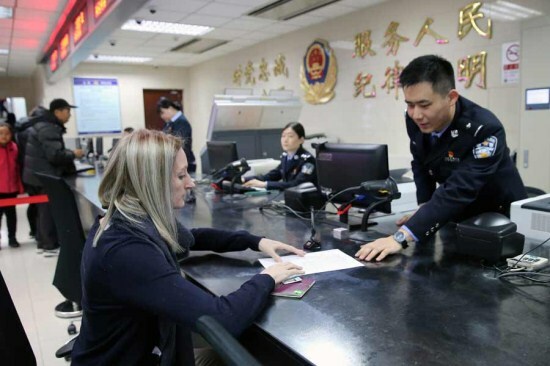 Expatriates in Shanghai are finding it easier to renew their visas and apply for permanent residence permits after a set of new policies came into effect earlier this month, the Shanghai Exit-Entry Administration Bureau said on Wednesday. The new policies require fewer documents from foreigners. The policies exempt those applying for certain visas from providing documents concerning their Chinese hosts if the hosts remain the same from previously granted visas, said Cai Baodi, foreigner visa management division chief at the bureau. Specifically, the measures bring convenience for applicants seeking the following visas: short-term family visits (Q2 visa), short-term private matters (S2 visa), short-term studies (X2 visa), business trips (M or F visa) and talent visas (R visa). As for those applying for permanent residence permits, known as Chinese "green cards", the new policies have loosened requirements for some of the supporting materials. Annual inspection certificates for foreign-registered companies can be replaced by the company's annual report. Cai said the new policies will provide convenience for foreign students when they return to Shanghai after the upcoming Chinese New Year. Liu Tiantian, a staff worker at the bureau, said the new policies increase workloads for frontline staff as they need to examine previous application documents. But the bureau has upgraded the system to ensure efficiency and accuracy in visa work, and applicants normally receive a response within seven business days. James, a Briton working at a German pharmaceutical company in Shanghai who would only give his first name, said the visa application process has become easier recently. He has lived in Shanghai for seven years, and has applied for both student visas and residential permits. Due in part to its favorable visa policies, Shanghai has for six consecutive years been voted by expatriates as the most attractive Chinese city to work in, according to the State Administration of Foreign Experts Affairs. According to the administration, Shanghai has the largest employed expatriate population－some 215,000 people－among all Chinese cities, accounting for 23.7 percent of the nation's total. More than 100,000 work visas have been issued to expats in Shanghai since 2016, with more than 18 percent of them being talent visas.